With 10,000 fiber producers and only one working mill, 97% of Kentucky's raw natural fibers are sent out of state to be scoured, carded, and spun, resulting in higher costs of production and longer turnaround times for farmers. Most Kentuckians don't even know we have a mill. They do know we are desperate for both local milling services and shearers. Enter Ballyhoo Fiber Mill, the purchase and rebranding of US Natural Fibers. Kentucky Fiber Producers: the 10,000 individuals raising wool sheep, llamas, alpacas, goats, rabbits, or other fiber producing animals in the Commonwealth of KY. Over 50% of Kentucky’s fiber producers fall into the “small” category, meaning they operate with no more than 50 breeding females. Ballyhoo Fiber Mill is a key component in the creation of a statewide Fibershed affiliate, as the fiber must be processed within 200 miles of the farm. Fiber Producers in the greater Tri-State Area: fiber producers outside Kentucky who desire high-quality milling services in a reasonable time frame. With production and shipping costs on the rise, producers are looking for high-quality milling services within a reasonable distance and turnaround time. US Natural Fibers is the only mill in Kentucky, and one of three mills in the region serving the needs of small producers. The keys to our success lie in our commitment to Kentucky producers, our focus on education, and our ability to offer complete in-house services including a dedicated shearing floor. Not only will small producers be able to trailer their animals in and have them sheared on site, we will be able to teach shearing year-round! 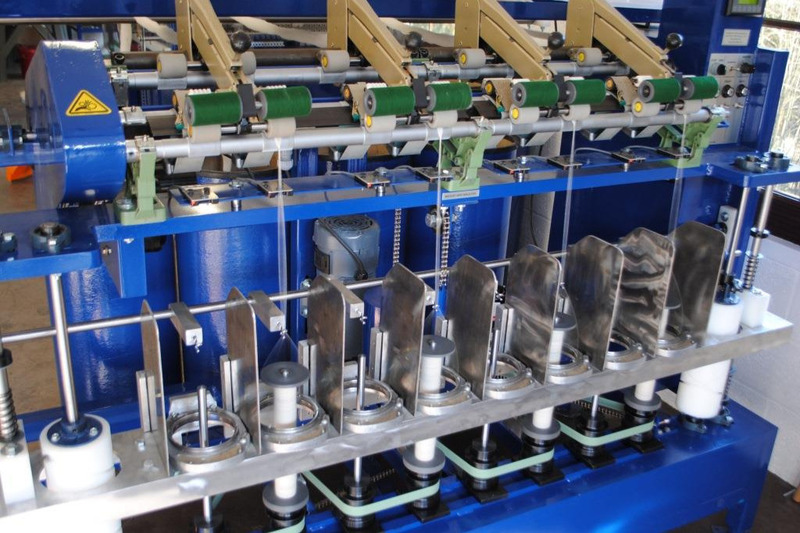 Ballyhoo Fiber Mill is acquiring US Natural Fibers’ Belfast Mini Mill Equipment. This equipment is currently functioning and comes with several safety upgrades. We will be able to provide: scouring, picking, carding, spinning (laceweight through bulky yarns), cone and skein winding, and rug yarn. We plan to spend our advertising dollars on sponsoring agricultural and fiber-related programs (such as State Fair, FFA, 4-H, fiber festivals, NAILE, and more). Supporting youth in agriculture is central to our mission of building the fiber industry in Kentucky. We will partner with the Kentucky Sheep and Goat Development Office and the Kentucky Sheep and Wool Producers’ Association throughout the year. Our initial focus will be on supporting shearers and the annual state wool pool. Ballyhoo Fiber Mill will purchase all natural colored fleeces offered by Kentucky producers. We also intend to host ASI courses on wool grading and classing, which have not been offered in our state before. Early Donors (June 18th - July 1): Priority queuing when we accept fleeces! So here we are. It's October, and we've officially lost both the intended site and first dibs on the equipment. We actually found a potential location that is closer to our farm (actually farm adjacent) and wouldn't give us any trouble about shearing on site like a city location would! Bonus, it'd be cheaper to buy and set up! We're also exploring the idea of purchasing enough equipment to get started (ie. scourer and carder), and grow as money allows. This would enable us to help producers get their fleeces clean and at least have local roving, but we wouldn't be able to spin for you for quite awhile. In short, good news = we haven't given up! Bad news = it's going to take longer than we anticipated. If you're still in support, we thank you. If you'd rather pull out, we understand. We've gone a little ways backwards on our goal. We lost a $500 grant. However, we are still raising funds until September 1 AND we will be applying for a $5,000 grant! Help us keep the ball rolling! More great stuff to share. Did you know Kentucky was home to over a dozen fiber mills??? I received the best suggestion today from a supporter on Instagram! You guys are SO SMART AND AWESOME!! I'm going to add a letter of intent for indie dyers who may wish to purchase blanks from the mill. You'll be able to select your desired weight, amount, time frame, and fiber type. Please keep the suggestions coming!